We present a novel and exible bubble modelling technique for multi-fluid simulations using a volume-fraction representation. 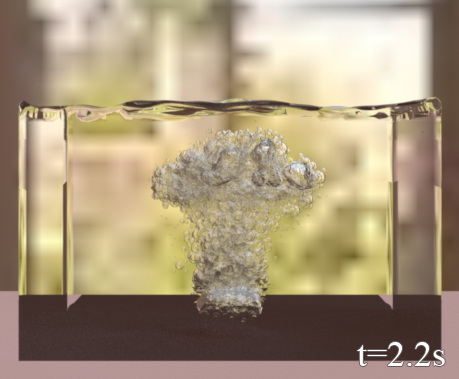 By combining the volume fraction data obtained from a primary multi-fluid simulation with a simple and efficient secondary bubble simulation, a range of real-world bubble phenomena are captured with a high degree of physical realism, including large bubble deformation, sub-grid bubble motion, bubble stacking over the liquid surface, bubble volume changing and dissolving etc. Without any change required to the primary multi-fluid simulator, the proposed bubble modelling approach is applicable to any multi-fluid simulator based on the volume fraction representation.